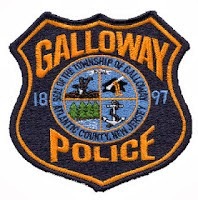 Galloway Township Police responded to 774 calls for service during June 29, 2014 through July 7, 2014. Additional statistics include: 3 Burglaries, 21 Motor Vehicle Accidents, 68 Tickets issued, 3 Driving While Intoxicated, 47 Arrests, 6 Domestic Violence, 13 Fire Calls, 101 EMS Calls and 1 Juvenile calls. Jordan B. Jerrold, 26, of Yardley PA was arrested by Ofc. Ronald Gorneau for DWI on June 29. Farhaz Aziz, 24, of Galloway was arrested by Ofc. Bill Kline for DWI on June 29. Robert Smith, Sr., 32 of Cape May was arrested by Ofc. Brian Tennant for DWI, possession of CDS, and possession of a hypodermic needle on June 29. Edwin H. Fisher III, 32 of Galloway was arrested by Ofc. Dominic Fabrizo for possession of drug paraphernalia, possession of hypodermic needle, and possession of CDS. Carmelo Alberto Perez Jr., 24, of Hamilton Twp. was arrested by Ofc. Kerry Baerman for fraudulent use of credit card and credit card theft on July 2. Michael C. Pansa, 33, of Hamilton Twp. was arrested by Ofc. Dominic Fabrizo for contempt on July 3. Nathaniel L. Parks, 31, of Galloway was arrested by Ofc. Scott Winneberger for possession of less than 50 grams of marijuana on July 3. Nicholas R. Wolfe, 29, of Egg Harbor Twp. was arrested by Ofc. Matt Worth for contempt on July 4. Anthony E. Ardente, 20, of Galloway was arrested by Ofc. Fenil Ghandi for urinating in public on July 4. Anthony D. Copes, 46, of Galloway was arrested by Ofc. James Mullholland for identity theft and hindering apprehension on July 5. Edgar Sales, 24, Sarbelio Perez-Ramirez, 28, Javier Luis-Gomez, 18 and Marco Antonio, 23, all from Galloway were arrested by Ofc. Scott Winneberger for obstructing the law on July 6. Jonathan M. Storey, 31, of Hamilton Twp. was arrested by Ofc. Brian Tennant for theft of property and defiant trespassing on July 7.